• Apples contain almost no fat, sodium or cholesterol. • Apples deserve to be called “nutritional powerhouses”. 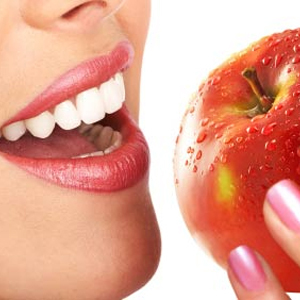 • Apple fruit contains good quantities of vitamin-C and beta-carotene. Vitamin C is a powerful natural antioxidant. Consumption of foods rich in vitamin C helps the body develop resistance against infectious agents and scavenge harmful, pro-inflammatory free radicals from the body. • B-complex vitamins (riboflavin, thiamin, and vitamin B-6) – these vitamins are key in maintaining red blood cells and the nervous system in good health. • Apples are low in calories; 100 g of fresh fruit slices provide just 50 calories. They, however, contain no saturated fats or cholesterol. Nonetheless, the fruit is rich in dietary fiber, which helps prevent absorption of dietary-LDL or bad cholesterol in the gut. The fiber also saves the colon mucous membrane from exposure to toxic substances by binding to cancer-causing chemicals inside the colon. • Apples also carry a small amount of minerals like potassium, phosphorus, and calcium. Potassium is an important component of cell and body fluids helps controlling heart rate and blood pressure; thus, counters the bad influences of sodiumApples are rich in antioxidant phyto-nutrients flavonoids and polyphenolics. The total measured anti-oxidant strength (ORAC value) of 100 g apple fruit is 5900 TE. Some of the important flavonoids in apples are quercetin, epicatechin, and procyanidin B2. Additionally, they are also good in tartaric acid that gives tart flavor to them. Altogether, these compounds help the body protect from deleterious effects of free radicals. A collection of research studies suggests that apples may well be one of the best foods people should add to their diet.